June is recognized as National Pet Microchipping Month, and it’s a great reminder to make sure that you have your pup microchipped if you haven’t already. Microchips are a superb way to help find your pet in case they go missing. 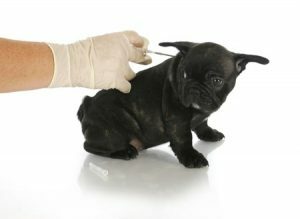 Inserted beneath your pet’s skin – usually in the back of the neck for dogs and cats, where there is extra tissue – microchips help pet owners reconnect with their animal if he or she goes missing. The microchips do not cause your pet any discomfort and can be a great aid in finding a lost pet. Similar to GPS, microchips help owners locate their pet if he or she goes missing. This is a fantastic tool as it stays with your pet wherever they go. Collars and tags can fall off or become lost. Plus, they rely on a good Samaritan to first come across your pet and then take the effort to call the number on the tag. While these are still great options, they do not offer the reliability of a microchip. With warmer weather, pets may be inclined to spend more time outside. With more walks or just free time in the backyard, the likelihood of a pet accidentally running away increase dramatically. There is nothing worse than losing a pet. You want to find them quickly before they get hurt or lost. Having a microchip in place can help reduce the time it takes to identify your pet if found by someone else, helping to get your pet back home to you safely and quickly. Putting a microchip in your pet is quick, easy and painless. Use June as a time to get it done if you haven’t already. Pets are members of every family they are a part of and nothing is worse than losing one. Help ensure they come back home happy and healthy. If you have any questions about microchips or are interested in adopting your next best friend, reach out to Pauley’s Pups today by calling 804-798-7877.